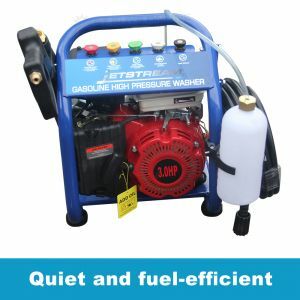 The Jet Stream Pressure Washer JET3500A is your perfect partner to improve the way you clean - whether powerful cleaning or gentle cleaning tasks. 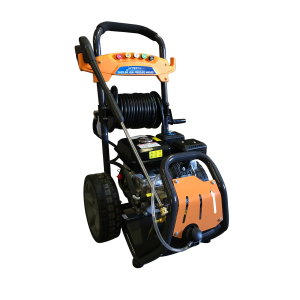 Filled with innovative features, this Jet Stream Pressure Washer offer the right solution for every cleaning task! 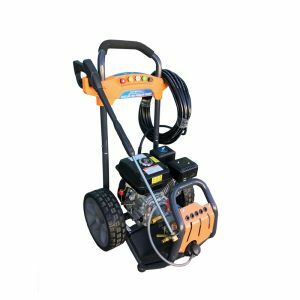 Producing a massive permissible 3500PSI and 9 Litres per minute , this device use less water than a garden hose while makes cleaning considerably easier and more efficient. Simply switch to any of the included 5 Nozzles and you can go from light cleaning to paint stripping or used for a variety of outside tasks such as cleaning backyard patios, decks, driveways, washing down patio furniture, vehicles and much more. The variety of nozzles achieve up to 75 times more cleaning power than an ordinary hose. Built with a durable protective frame, pneumatic wheels and Quick Connect fittings, JET3500A is a dedicated work for your project and can be transported to any job site with ease. The detergent can be replaced quickly and conveniently with just one simple movement.